Gone are those days when jewellery was used to merely elevate your style quotient, today it’s a part of a much bigger picture. Today, jewellery is considered essential in distinguishing your personality; you can opt for items that resonate with your aesthetic tastes and of course, with who you are as a person. The resurrection of stackable rings is helping young women with just that. From Emma Watson to Rihanna, from Jennifer Lopez to well, your NRI cousin who happens to be your fashion icon (secretly, of course), you have seen them do those chic-looking ensembles on their dainty fingers. These jewellery pieces have broken free of connotations of being funky attached to them. But, what are they exactly? 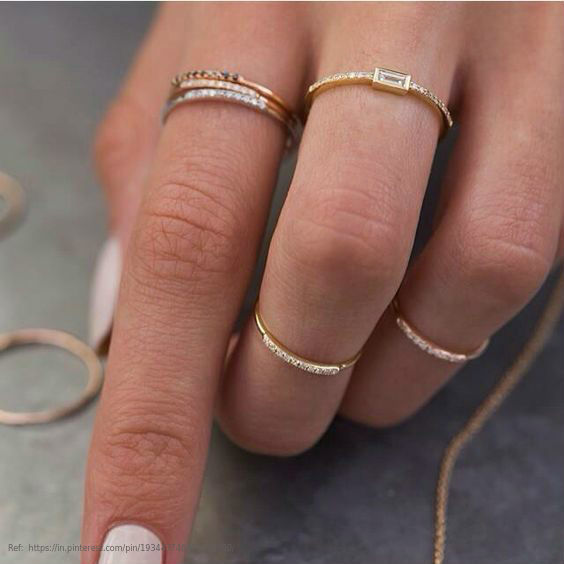 As the name suggests, stackable rings are rings stacked on top of another, either all on one part of the finger or spread throughout the length of the finger, such as below the knuckles. There are myriad ways in which you could wear stackable rings that suit your own personal style quotient. We walk you through some of them and by the end of this post, we’re pretty sure you’d be asking yourself—why on earth haven’t you been wearing them all along? Why stick with one when you can flaunt many. Plus, stacked finger rings and bands will beautifully complement your perfectly manicured nails. 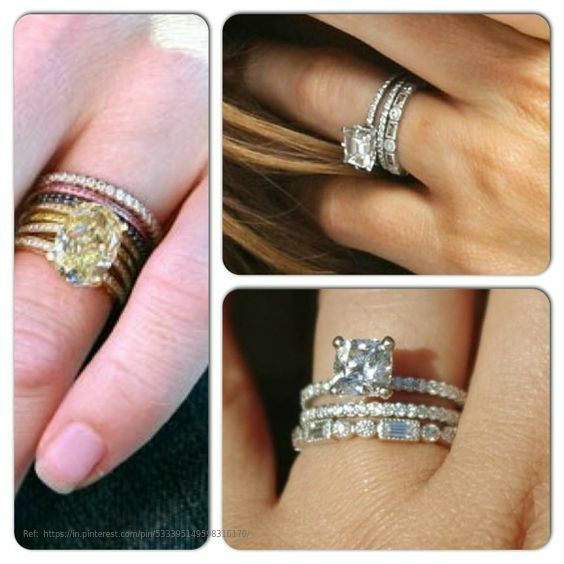 How to wear Stack Rings? Here are some of the ways to wear stackable rings to accentuate your inner fashionista. For people who come from the “less is more” school of thought, you do not have to shy away from the trend of stackable rings, just because this is not your style. With minimalistic designs available to match your subtlety and panache, you can go all out and explore stacked rings, without threatening your taste in jewellery. You can go for the super thin stackable rings or can choose to pair them up with a gemstone for some added elegance. Stack up with the Wedding Ring! A lot of couples today are choosing to ditch those age-old traditional gold bands and are opting for white gold or platinum for a more sophisticated and contemporary look. Rose-gold is also climbing up the charts as one of the most popular choices among young couples for wedding rings. Surprisingly, for those of you looking for out-of-the-box wedding ring designs and ideas, you have at your disposal a wide range of options – from personalized initial stackable rings to stackable diamond wedding bands. These additional bands do not just act as accoutrements or supporting accessories, but they make a strong style statement. 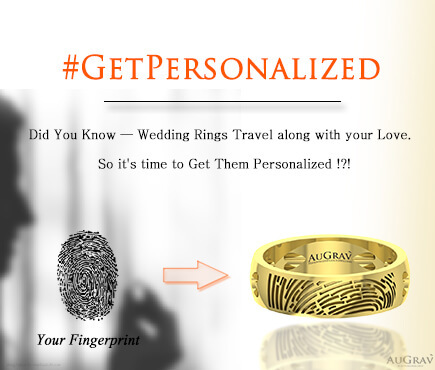 These personalized rings will also make a thoughtful gift for a loved one. Antique is the new, new! 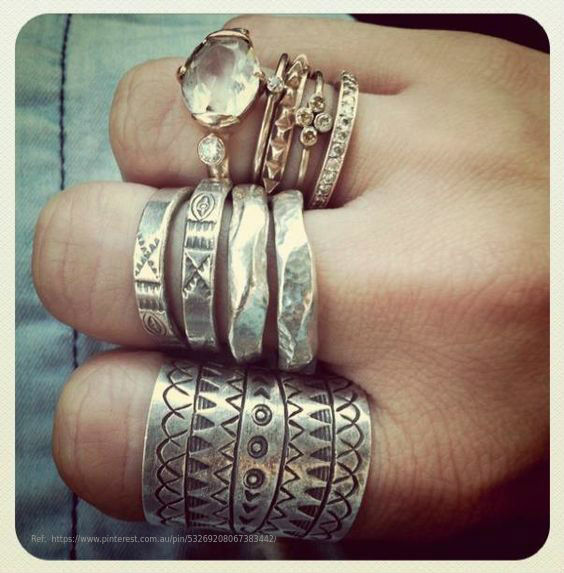 Yet another stunning way of wearing stackable rings is to go vintage. 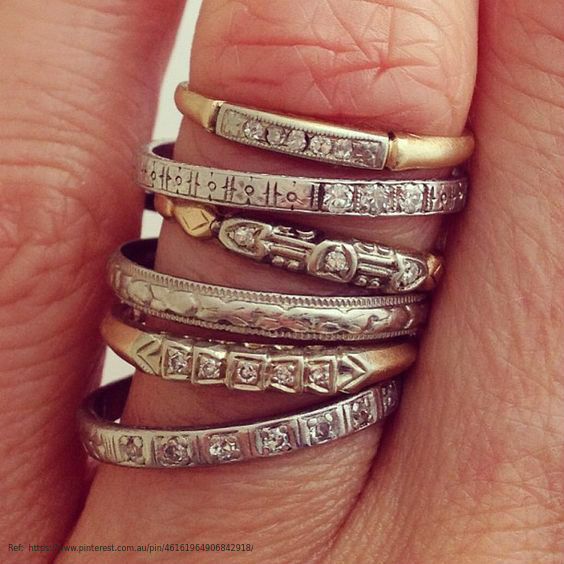 Yes, that’s right—antique stackable rings are not really out of style as you’d have imagined. Vintage or ancient rings can be played around, mixed and matched to suit any attire. You can even add a tinge of colour to it and you would be party-ready. Pair it up with a crisp white button-down shirt along with silver or oxidized jhumkas and win yourself the ‘slay-queen’ title at work. 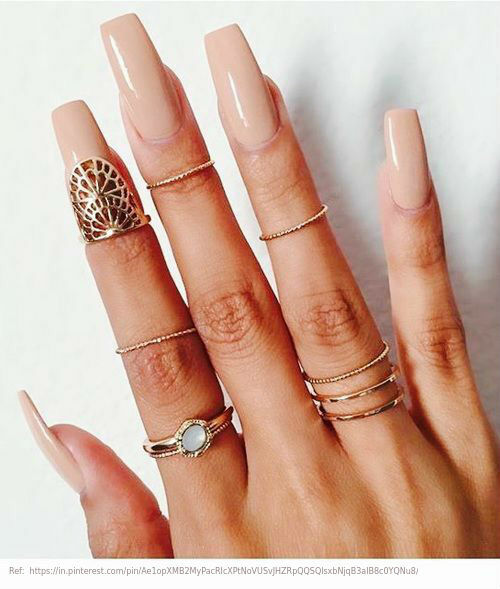 Knuckle rings, also known as tea rings, are worn just above the middle joint of your fingers, that is, your knuckles, rightly as the name suggests. And a midi ring sits on your finger above the lower knuckle. 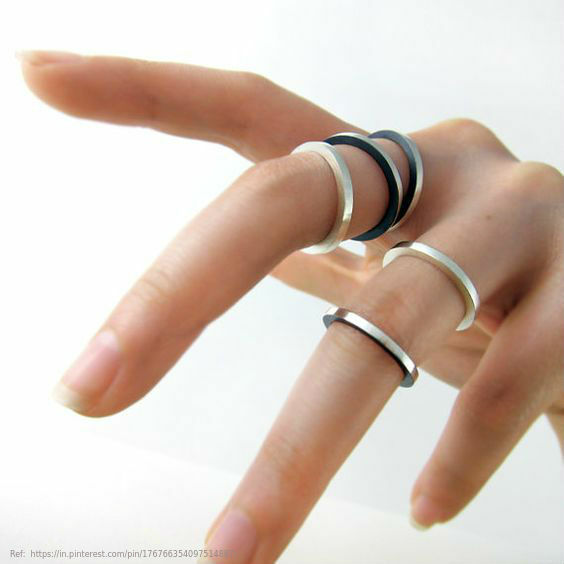 In the above image, you see a combination of stacked rings, midi rings and a knuckle ring. See, how they all work together to give such a splendid look to your hand? If you decide to buy high-end stackable jewellery, you can opt for flat edges and single stones that manifest great finesse and be mindful of choosing good quality enamel. Also, choosing a heavier metal in a slightly darker tone will add further richness to the look. If it has to be a big investment it should be one you can be proud of, one you can cherish forever. When picking out stackable rings to accent your fingers, there are a couple of unsaid rules (yes, you are under the fashion police’s watch) that you must make note of. Firstly, keep your fingers groomed or else that will draw more attention than the rings. 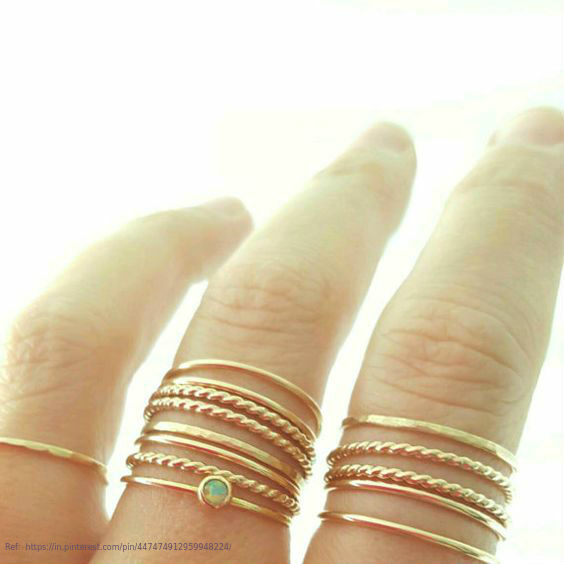 To conclude, stackable rings offer you the liberty to experiment, you can re-fashion them to suit your taste and style. No matter your preference, do not be afraid to mix different metals, sizes, shapes and textures. The most important point is to wear your confidence and you will be able to pull off anything. Your style is your creative expression. Do not let anybody else take that call for you! All You Need To Know About The Stackables! Overall rating: 4.7 out of 5 based on 235 reviews.